Are you looking for vegetarian crock-pot recipes you can try? Everybody loves the idea of cooking without the hassle of worrying if your food is overdone. With a crock-pot, you simply put some of the ingredients into the pot, turn it on, and leave it. At the end of the day, you get to enjoy a delicious meal without much hassle. Often times, beef recipes are being cooked in crock-pots. However, you may want to consider these 5 easy and money-saving vegetarian crock-pot recipes for your dinner. Nothing is better than to enjoy a hot and delicious soup during cold winter nights. 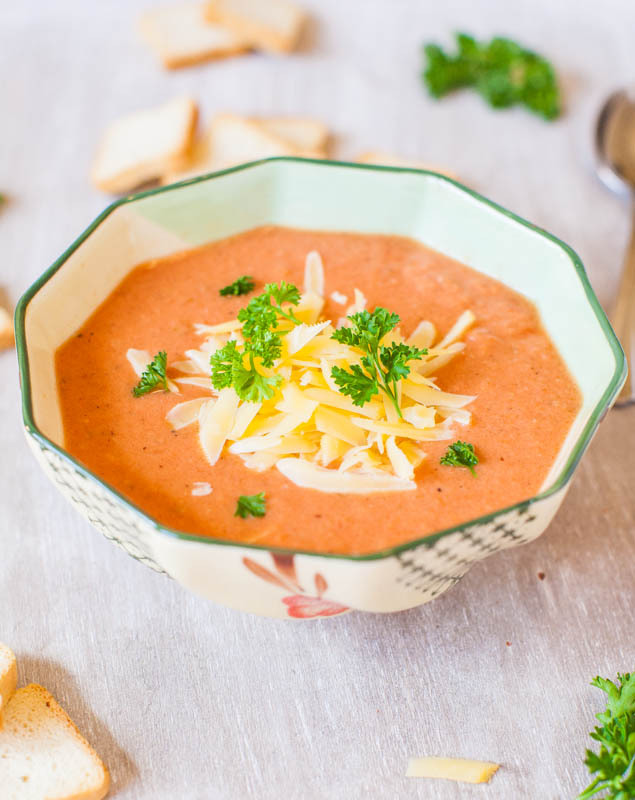 If you want to have a delicious and hot meal on your dinner, but don’t have enough time to cook, then this creamy vegan tomato soup will save your day. 1) Put the vegetable stock, plum tomatoes, tomato paste, butter, onion, and garlic in the crock-pot. Stir and mix well. 2) Turn on the cooker on low heat for about 6-8 hours. 4) Add the heavy cream, if desired. 5) Season with salt and pepper to taste. 6) Serve hot and enjoy! Want to stick to a healthy diet? Try this baked bean recipe. It’s filled with delicious ingredients that will make your day a perfect and satisfying one. 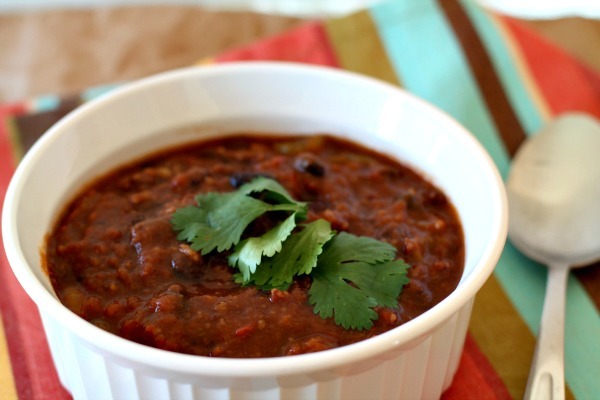 This recipe is one of the cheapest and easiest vegetarian crock-pot recipes to prepare. 1) Soak beans in water (overnight). 2) In the morning, drain the water off the beans with the use of a colander or a strainer. 3) When the water is drained off, put the beans in the crock pot. 4) Cover the beans with water, at least about 2 inches above. 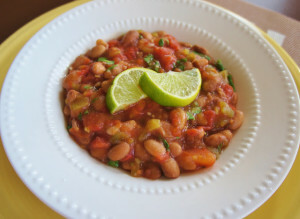 6) When the beans are tender, drain the water and put the beans back in the crock-pot. 7) Add the other ingredients – the tomatoes, chili pepper, garlic, onion, and lime juice. 8) Cover again, and cook on low heat for additional 3 hours. 9) Season with cilantro, salt, and pepper to taste. 10) Garnish with avocado and extra lime, if desired. 11) Serve hot and enjoy! 1) Add all the ingredients in a slow cooker. 2) Cover the lid, turn on the cooker to low heat, and wait for 3-4 hours. 3) When the cooking time is completed, transfer the mixture in a soup pot for further cooking. 4) Place the soup pot on a stove top and bring the dish to a boil. 5) When it boiled, lower the heat, cover the pot, and let it simmer for about 1 hour. 6) Add salt, pepper, and chili powder, according to desired taste. 7) Add your favorite garnish for additional touch. 8) Serve hot and enjoy! Want to try something different for dinner? 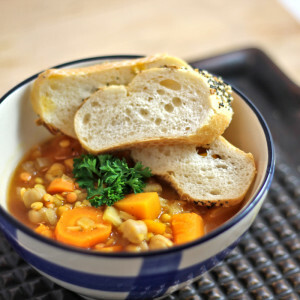 Try this squash, chickpea, and red lentil stew, and you’ll surely love it! 1) Soak chickpeas in cold water overnight. 3) Combine all the ingredients in a crock-pot except for the lime juice, cilantro leaves, unsalted peanuts, and some salt and pepper. 4) Cover the lid and turn on the cooker on low temperature for about 5-7 hours, or until the chickpeas and lentils become tender. 5) When the cooking time is completed, add the lime juice and stir. 6) Add more salt and pepper according to the desired taste. 7) Transfer the stew in a bowl, and sprinkle with cilantro leaves and peanuts. Sure, stews and soups are most popular in crock-pot, but that doesn’t mean you can’t try other recipes with the amazing crock-pot. If you want to go Italian, try to prepare this slow cooker vegetarian lasagna. 1) Combine the first five ingredients (egg, ricotta cheese, spinach, mushroom, and zucchini) in a large bowl. 2) In a separate bowl, mix the crushed tomatoes, diced tomatoes, garlic, and pepper. 3) Lightly coat the slower cooker (the bottom and the sides) with a few drops of olive or canola oil, then pour 1 ½ cups of tomato mixture into it. 5) Spread half of the vegetable mixture (step 1) over the noodles, then spoon 1 ½ cups of tomato sauce on top of it. 6) Sprinkle it with mozzarella cheese. 7) Repeat the layering process until you make three layers. 8) Cover the slow cooker with its lid, turn on the cooker on low temperature, and wait until the noodles become tender, typically about 2-4 hrs. 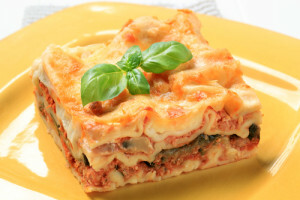 9) Once cooked, you can add more cheese, if desired. So, what are you waiting for? Grab your crock-pot and start making these money-saving vegetarian crock-pot recipes!